I suspect we all reminisce in very different ways. The extent to which we think about the past is maybe dependent on our age. As we age we tend to look back as often as we project forward. Reflection and recalling past events can be a powerful and rewarding experience. However sometimes remembering can also raise painful or difficult memories. Some people simply prefer to forget, reminiscing is not for them, that’s okay, there are no rules to any of this. Not many of us are lucky enough to carry only good or happy memories. The journey of life usually gives us a few tricky bits to navigate. What is interesting to me is even if times were, or remain tough, reflection and memories still seem to hold fascination and take on a special meaning for many. Recently, I came across an intriguing social media site about my old home town. The site is called ‘Lost Maryborough’. What a delight to find historical photos of schools and public buildings that were so very familiar to me as I grew up. There are videos of older community members sharing their thoughts and memories from days gone by. Old time music played by local musicians at the town dances triggered feelings and familiarity that I had almost forgotten. Of unique importance is a beautiful collection of quirky but remarkable wedding photos. These photos were taken over fifty years by a well-known local identity (everyone who lived in Maryborough knew this person) who devoted his life interest to weddings, anyone’s wedding! What a nostalgic trip down memory lane this site provides. At the time, and for several years after I left the comforting clutches of my small country town, I considered the place boring and lacking sophistication (whatever that was or is!). I think it’s normal for some country people (especially the young) to move away and experience what they think is different and somehow more exciting elsewhere (of course, the secret’s out, it isn’t!) Anyway, so off I went, marrying someone also from my town but working and living elsewhere. Naturally, we returned on a very regular basis. Our two son’s got to know the place very well and spent many happy holidays with grandparents in Maryborough. New Years Day with piped bands, highland dancing, sporting events and family were part of the deal. They even have special items and letters buried in a time capsule at the Bristol Hill Tower. My sons share an affinity with my home town despite never having lived there. Often referring to Maryborough they remember scuttling up the tower with Nana not far behind. Secretly, they carved their names in the rocks in the bushland! Interestingly, what I suspect can happen when moving from the place of one’s upbringing to a place of choosing, is that an unintended emotional distancing can creep in. It wasn’t until my Mother, having moved away from the town for a decade, decided in her very old age to move back, that I had to significantly re-engage with a place and space that was familiar but also different. During that period there were times when congruity did not exist for me in Maryborough. The structural landscape was very recognisable but the societal landscape often felt foreign, then a familiar face would appear and the old knowing would return. I should mention that when a familiar face did appear (albeit an older face) it was always such a joy to re-engage with my own early history. Shared historical experience is a connection that is close to a primal response, I suspect. I do wonder however, if this feeling is heightened for someone when they have moved from their orignal place of belonging. I had a great-uncle who lived all of his adult life away from Maryborough. Over the years he sought out many return visits and loved to reminisce with family members whenever he did so. He lived in Sydney for decades but his final wish was to have his ashes returned home to be buried with his Mother. The family carried out his request and he was finally home where he considered he belonged. So it seems that reminiscence is an integral part of belonging or perhaps seeking belonging. It stands to reason that as we age and move through the various life stages that reflecting back and making sense of attachments is important. We all need, I suspect, a place and space that represents who we are to a certain extent. As a person who has spent more time away from my original environment than in it, I was delighted to discover when I was viewing ‘Lost Maryborough’ my memories were strong, enjoyable and connected. Reminiscence is a fascinating experience. 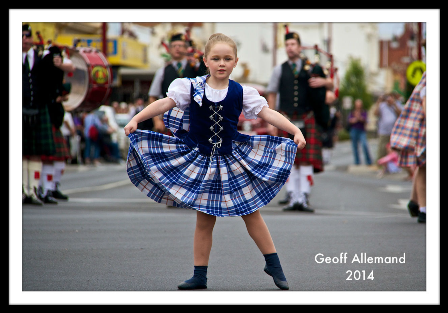 This fabulous photo was taken in Maryborough at the Annual Highland Day Gathering Procession on the 1st January 2014 by Geoff Allemand, founder of ‘Lost Maryborough’. Thanks Geoff! This entry was posted in Life, People, Relationships and tagged Belonging, Connectedness, Family, Maryborough, Reminiscence. Bookmark the permalink. I agree that the shared history with others is a kind of primal experience. Sometimes when I hear about the Indigenous connection to land I think of my small, home town and how well I knew all of her nooks and crannies so intimately. How these places almost resonate energy for me still today when I visit them. So glad to read this. Even though I have lived for more years in Shepparton (34 in fact) and only 15 in Maryborough Vic, I still call Maryborough home. Those 15 years were very impressionable and forming who I was to become. My Facebook page and associated website continue to grow in interest and it brings me much pleasure to share the history and the memories. Having spent my childhood in Maryborough and returning regularly to visit my mother I can very much relate to your article. My three adult children look back fondly on their time spent there too.